We’ve all heard about those kids. You know, the ones who make it onto daytime talk shows. They have 8 million hits on their YouTube channel by the age of 2, or raise millions of dollars for a charitable organization by the age of 10, or get into Harvard Medical School by the age of 16. As parents, we love our kids and want them to do the best they can, and we know they are simply the best ballplayer in the region (yeah, right) or think they must possess genius because the oatmeal they left behind in the bowl somehow resembles Albert Einstein. Yes, our kids are destined for greatness … or a bad haircut. But when we look at the kids described earlier, we can’t help having a twinge of jealousy. The lesson here is, look for the small stuff — and don’t rush the big stuff. I was completely guilty, a few years ago, of trying to rush my kids. I wanted them to take initiatives in their school, be leaders, join the Eco Club and the Healthy School Committee. But my older son Russell (who was 9 in 4th grade last year) was not interested. My hopes and dreams of his being on Ellen as a ‘tween heartthrob activist and philanthropist were washed away … or were they? Russell was chosen by his teacher to be eligible to apply for a leadership program in the city. Russell applied and needed to come up with a few different ways he could help his community. One of the ways he chose was to help the animals, because they are indeed part of our world and our community, too. This amazing program provided him with a 1:1 coach who called him weekly and gave him the tools and skills he needed to create an event. I was so excited for him, we … I mean, he would finally have the opportunity to think about people outside our family without my leadership. And then I realized: He was only 9. He had a lifetime to do good. Oh, boy, we parents really are nuts. At that point, I decided to take a step back and let him handle this without my influence. Over the months, Russell planned and strategized. He researched different organizations in our area that helped animals. He knew about two first-hand, one being the SPCA, where we adopted our cat, and the other the Story Book Farm Primate Sanctuary. We had visited the sanctuary as a family a bit back and helped sponsor a fundraising event for them as well. 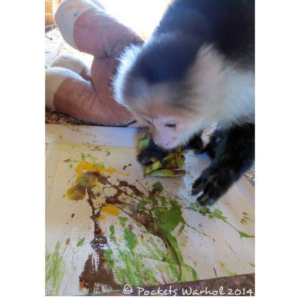 Russell was intrigued by the fact that his friends didn’t know about the primate sanctuary already, and he could raise their awareness. He really enjoyed watching the monkeys on their Instagram account. He knew that he needed to raise more awareness about them. So Russell set to work. 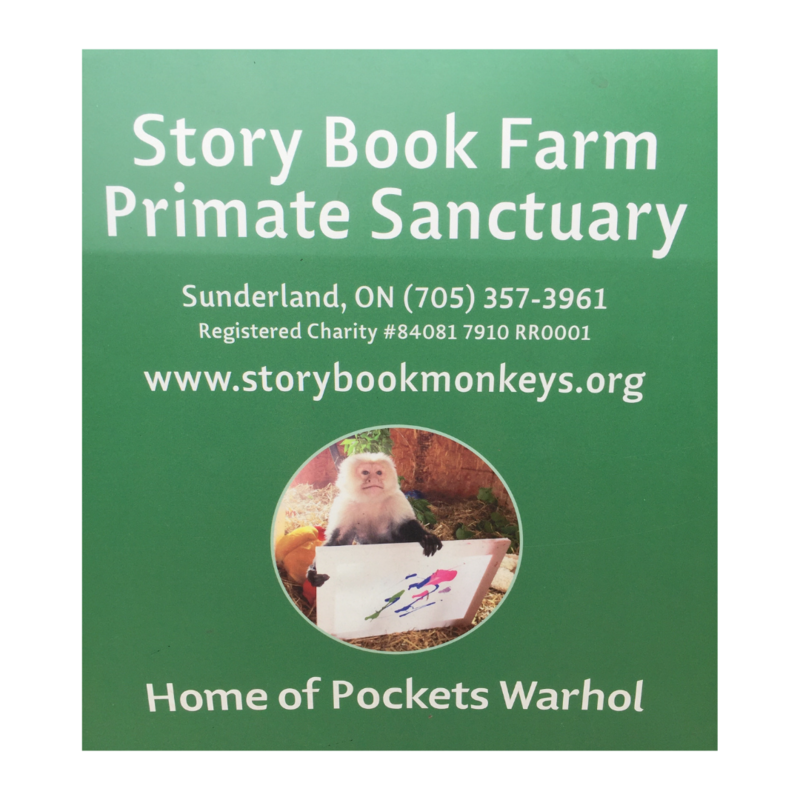 He contacted the director of the Story Book Farm Primate Sanctuary, which happens to be one of two primate sanctuaries in Canada. He introduced himself and made her aware that he wanted to help them out. She quickly set a date with him to bring his friends and family. He wanted to know what he could do to help besides collect funds, as the children in this program were not allowed to collect money. Together they decided that he would collect items needed to make the sanctuary run. Old blankets and towels, cleaning supplies, perishable and non-perishable foods, and specific brands were put on a list. Russell made a flyer with his coach (which had to be redone three times as pertinent information was left off each time… Oh, well, it’s all part of the process!). You’ve heard about the perfect storm? Well, here in Canada we had an ice storm in the middle of April, on the day of the event, when 20 of Russell’s friends and their families were going to meet Darwin the Ikea Monkey, Pockets Warhol, and all their furry friends. It was very disappointing and brought on quite a few tears. As parents, our hearts broke. But we knew that this was a great opportunity for Russell to think and problem solve about what he could do. So we texted all the families and rescheduled for another time. Unfortunately, many people could not come out on the new date, but the awareness was there, the curiosity to go another day was piqued, and some of the donations had already been collected. All in all, it wasn’t so awful. Finally, the new event date arrived. We packed up our cars, picked up some of our guests, and set out on our 1.5-hour drive to meet up with the rest of the visitors, the volunteers, and, of course, the monkeys and lemurs. It was really the perfect day. We met two of the new long-tailed macaques, caught a glimpse of Darwin (he’s really shy), and Russell even got a chance to play a game of catch the ball with Pockets! That day I saw my child as someone responsible for making an important difference. Many people do not realize that there are thousands of abused animals that need a place to live peacefully. They have no idea that sanctuaries like this one even exist, or where these animals come from. They don’t know about the legal exotic-pet trade here in Canada, the way animals are being exploited in sideshows, or how severely traumatized the monkeys used for scientific purposes can become. That day I saw my child as responsible for collecting hundreds of dollars’ worth of supplies needed to make the sanctuary able to run. This sanctuary, like many out there, does not receive any public funding and relies on donations to exist. That day I saw my child’s confidence rise. He made a plan and carried it out. It didn’t matter to him if he reached 10 people or 10,000 people. He did it. He carried out his plan. He made a difference. He did it for the animals. I could not have been more proud that day. Adam and I watched our little boy smile, take charge, write letters of gratitude to the visitors, and simply do what he felt was the right thing. I must admit, I’m a little teary right now just reminiscing over it. I’m reminded that it’s not the events that get all the publicity, or the events where the big- gest celebrities show up, or the events that raise millions of dollars that really matter. It’s the many small events, the ones that raise awareness and people’s confidence so they will be willing to help again and again. So … the next time you find yourself wondering if your child is the next big advocate for a good cause, tell yourself that they already are. Every time they pet an animal kindly, every time they hold a door for a stranger, every time they put their only quarter in the charity box, every time they tell someone they don’t eat animals, they are flexing their advocacy muscles. They are practicing the skills needed to be kind, compassionate, and caring inhabitants of this planet. Know that they are not only destined for greatness. They are already living it. Shoshana Chaim is the co-host of The Plant Trainers Podcast and a Family Health and Wellness Coach working to alleviate the stress in life caused by diet, unhealthy lifestyle, and chronic illness. As a magazine writer, TV guest, and international speaker, Shoshana inspires others with her personal and family health journeys as well as practical ways to improve quality of life through nutrition and fitness. She is now the proud author of her Yummy Foods Activity Book For Kids.